We had discovered a Breville Juice Fountain in the kitchen downstairs. The first day we tried it Barret erred on the side of vegetables. It didn’t have to taste good, it just had to taste healthy. 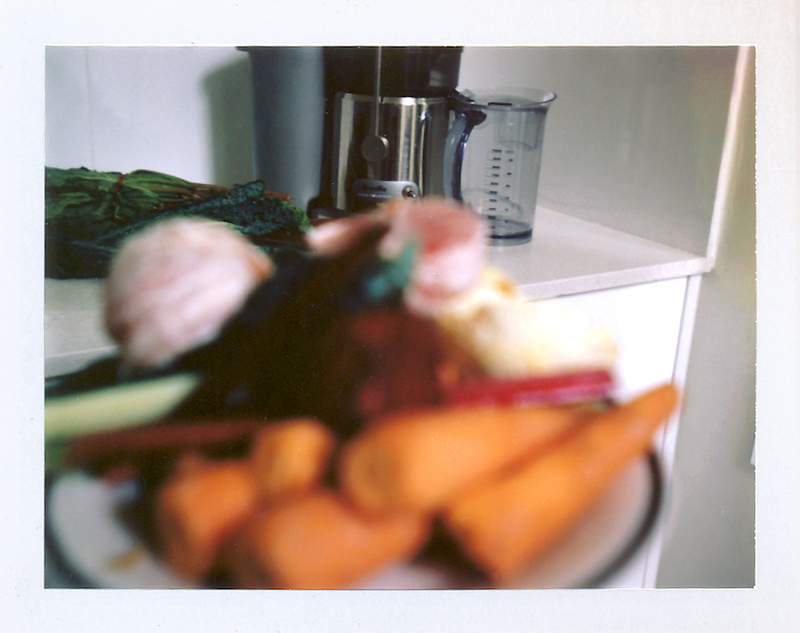 Whole bushels of carrots, beetroots and celery were minced till they bled sherbet-colored blood and their fibrous structures tossed aside like pencil shavings. He tossed in a hunk of ginger and, as an afterthought, an apple. Barret loved it but I wanted more sweetness. The following day, we made juice for breakfast. We wanted to impress our guests with our best blend yet. In an effort to achieve maximum vitamin potential, Barret and our friend Cade decided not to peel the oranges or the grapefruit. After six or seven citrus had been tossed in they added a few stalks of rhubarb. The juicer whirrrred and a fine mist of arterial spray shot out every time Barret raised the plunger. The result: hypnotically tropical colors with a foamy maroon head. The rind was so incredibly tart it coated our mouths like an extremely tannic and concentrated red wine. It settled in our bellies like lead. “Man, I am feeling all the toxins being released from my body!” Cade exclaimed. Barret nodded in solemn agreement. My mother, your grandmother, used to say, “A little of what you fancy does you good!” And in the case of your Breville I believe those words hold true. What on earth is in those clear rose balls? I have no idea what they are- but they are delicious! I’ve been thinking of getting a juicer but I fear the same thing will happen to me and then I’ll have to hear “Oh, another expensive thing we buy and you don’t end up using” (which obviously would be true..but who wants to hear “I told you so”! Thanks to your article I know I dont need a juicer at all! Or maybe a food processor,,, then you could make your own pesto!